Work Easier, Faster & More Effectively! PowerDesk® Pro 9 is the easy, fast and expert way to organize and manage the files, digital photos, MP3s and web images on your PC. With far more features and functions than the standard Windows file manager or other file management software, PowerDesk® Pro 9 gives you the tools to search, edit, track, delete, copy, move, sort, zip, label, view, convert and more! 6 Powerful File Utilities for the price you'd normally pay for 1! 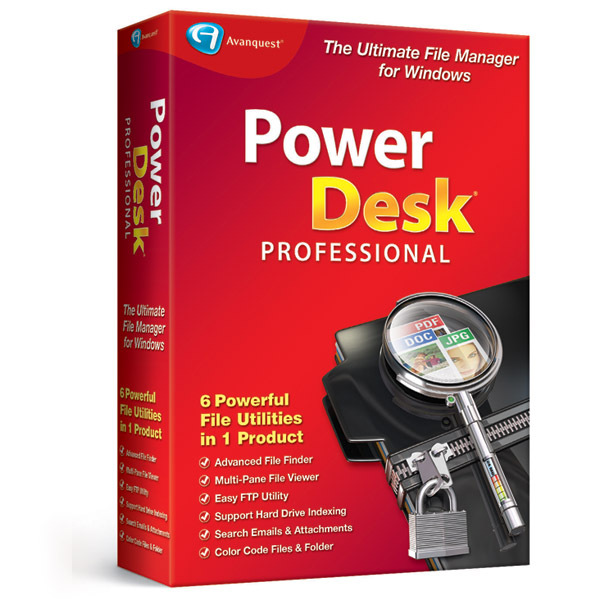 With top-ratings, reviews and awards from PC Magazine, Windows Magazine and PC World, you can trust the new PowerDesk® Pro 9 to expertly and easily replace Windows® Explorer with a wide array of powerful File and File Management tools. Completely customize your PC in a few clicks and see for yourself why PowerDesk continues to be the PC professionals' file management choice! FTP - Access PowerDesk FTP in an easy-to-use, drag-and-drop interface and view FTP sites as though they were ordinary folders! Once you've set up your favorite FTP sites, connecting with them is just 1-Click away. PowerDesk now supports Secure FTP! Sync Manager - Compare and synchronize the contents of two folders. Especially useful for work on files that are shared between two computers, it's also useful for backing up files and much more! Size Manager™ - A powerful utility that shows you where and how the space on each of your drives is being used. Using Size Manager makes it easy to efficiently manage drive storage space. Dialog Helper - Enhances Open dialog boxes and Save dialog boxes by adding a selection list for previously opened files and folders. It also provides a file viewer pane that supports over 150 file formats. Dialog helper also allows fixed dialogs to be easily resized. Archive Manager - Easily compress and expand files from over 30 popular compression formats. See within archives to view entire file lists, selectively view the contents or extract selected files with a simple drag and drop operation. File Finder - Quickly locate forgotten files with a powerful "search engine" type tool. Search by keyword, file type, size, or date range and see the "hits" displayed in a single-line reference. Search inside Zip files, archives, emails and attachments too! Great File Management you won't want to live without! Dual pane operation - Easily drag and drop files between folders and drives. Layout Manager - Single click icons save complete layouts or add layout icons to your desktop, so PowerDesk starts up exactly where you want it to! Add File Notes - With a right-click of the mouse, add notes to help organize your files - displayed in a mouse-over window or details view, easily be reminded what's in a file without having to open it! Color Customize Your File Folders - Easily customize and prioritize your file folders with eight distinct colors. File Info Column - Display specific details about each file in the file pane viewer. MP3 files will show a song title and run time. Images will show the size and resolution. Word documents show document title and more. MP3 Collection Management - Create and control portable MP3 playlist files as well as multimedia applications. Randomize feature ensures a complete random play order. Plus, cool tools to preview MP3 files, search for files, as well as rename and edit files groups in a single action. File Viewer - Open the right file the first time! Improved file preview options allow users to view the contents of a file in a preview pane or as a thumbnail image. Browse files from digital cameras, whole directories of images, or MP3 players - where you can even view by artist name, album title, or your own personal notations! Path Breadcrumb makes folder navigation easier and more convenient. Easily track where you are and where you've been. Pane Lock lets you easily synchronize views between any two drives at the same time - including network, external or backup! Network Behavior with better performance when navigating network drives. Favorites Management works more like Windows. Add a favorite in PowerDesk; see it in Windows and vice versa! Libraries Management is easier and more efficient. Any changes made in PowerDesk are shown in Windows and vice versa! File Viewer now supports image zoom, faster load times and improved file type support, including Office 2010 documents. Plus- customizable toolbar, super search engine, zip compression, file annotation, mouse-over file summaries and lots more! Ran out of space on your drive? Are your files scattered everywhere? No Problem! 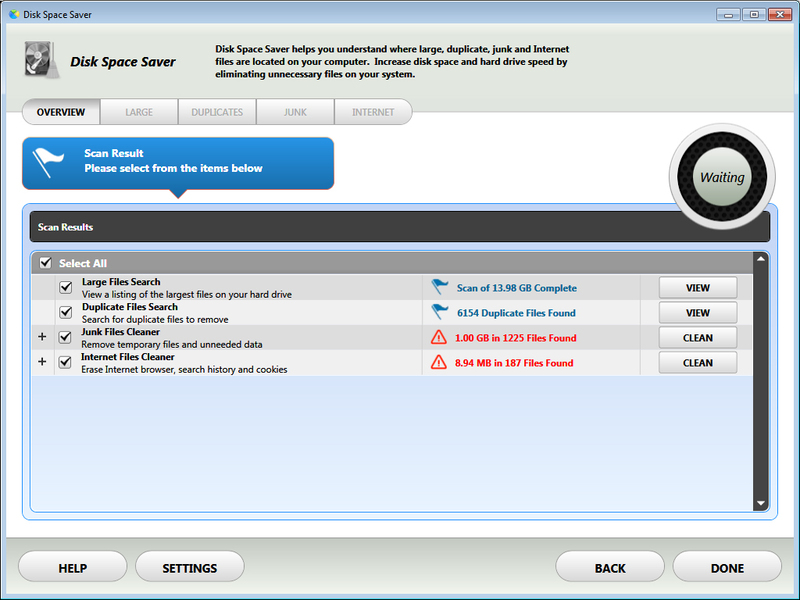 Disk Space Saver scans and identifies where all your large, duplicate, junk and Internet files are located. Get a visual display of your disk space usage that lists your biggest and duplicate files. 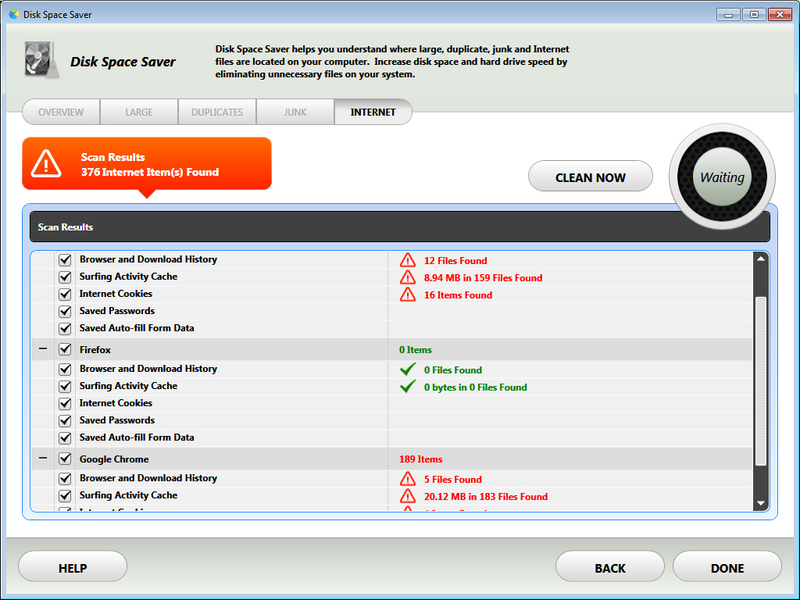 Save disk space by finding and removing duplicate files on your removable and hard drives. Clear browsers and download history, surfing activity cache, and Internet cookies. 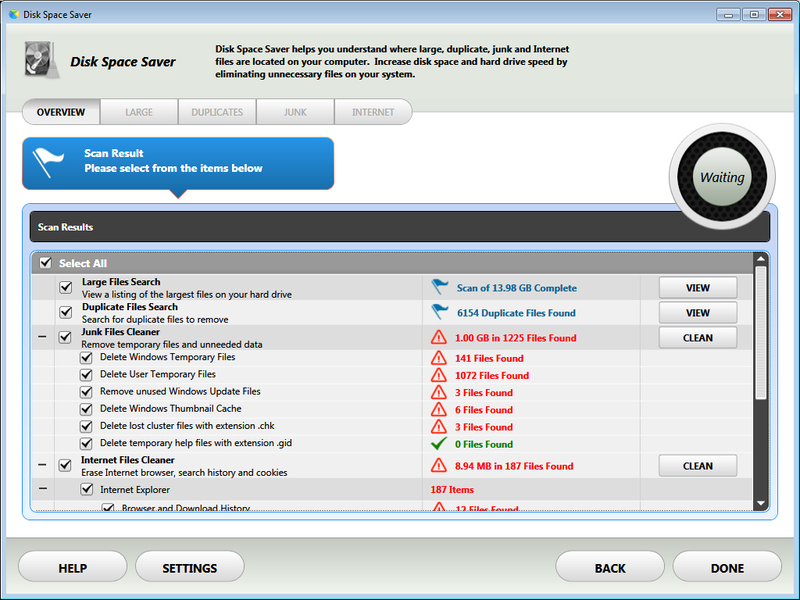 Identify and remove unnecessary system clutter, temp, and junk files. PowerDesk is now fully compatible with Microsoft Windows 10. Run System Suite with the peace of mind that you are fully protected and optimized. File viewer not updates to file clicked in a grouping. File Tips feature no longer locks files so that users can't move them after displaying a preview. Library folders now load much faster. "Send to" context menu has corrected location listed. Icons once again display properly in Details/List?Small Icons views. Status bar shows correct, refreshed information about grouping of files any time they are updated.